Learn several business ideas by studying the franchise concepts of the Cebuanos in celebration of the Cebu Business Month. <>The Philippine Franchise Association (PFA), the country’s premier and only internationally recognized franchise association, launched the Franchising NeGosyo Para sa Cebu last June 12 at the Ayala Cebu Activity Center as part of its franchise road show series designed to encourage would-be entrepreneurs to venture into the franchising business. It will last until June 14. 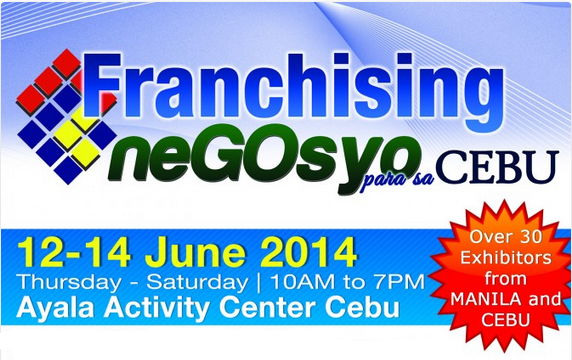 As part of the Cebu Business Month, the three-day event will present franchise concepts from Cebu and Manila. Entrepreneurs coming from different sectors and industries will showcase their different business ideas. Ilaputi restaurant owner Jan Rodriguez, Rhipstop Soul Clothing designer Ken Onozawa, and Ng Kai Development Corp. CEO and President Wilson Ng will attend as panelists for the expo. Exhibitors for the event include Mr. Quickie, Gamot Publiko, and the Cebu Chamber of Commerce and Industry. The PFA’s franchise show will also feature a free seminar on “How to Invest in the Right Franchise” on June 12 and 14 from 1:00 PM to 5:00 PM. For BPI KaNegosyo clients, a by-invitation seminar is scheduled on June 13 from 1 p.m. to 5 p.m. for aspiring franchisees. For those who want to grow their business via franchising, a seminar on “How to Franchise Your Business” slated on June 14 from 1 p.m. to 5 p.m. at the Crystal Function Room 2, Mandarin Plaza Hotel, is recommended. The three-day event is for aspiring business owners and even established entrepreneurs in Cebu and nearby provinces.